An earthquake swarm that began around 6 am Local time is now winding-down at Machin volcano (Colombia). None of the over 150 events has been reported "felt". The largest event so far has been a magnitude M1.8 earthquake. All the events cluster between 4 and 6 km depth beneath the volcano. Just 20 kilometers (12 miles) in diameter, Gaua Island is actually the exposed upper cone and summit of a stratovolcano that is 3,000 meters (10,000 feet) high and 40 kilometers (25 miles) in diameter. Most of the volcano is submerged beneath the Pacific Ocean. Also known as Santa Maria Island, Gaua is part of the Vanuatu Archipelago, a group of volcanic islands in the South Pacific Ocean governed by the Republic of Vanuatu. 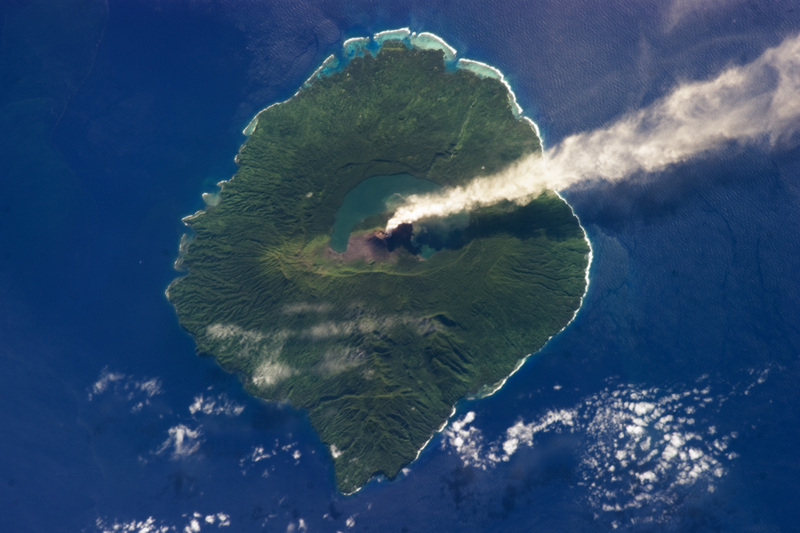 According to the Smithsonian Institution Global Volcanism Program, the most recent report of eruption activity at Gaua was a steam plume observed on April 29, 2013. This photograph records subsequent steam emissions observed on May 31, 2013, by an astronaut on the International Space Station. The steam plume extends east-southeast from its likely source at Mount Gharat (also spelled Garat or Garet), a historically active cinder cone located along the southwest flank of a 6 by 9 kilometer (4 by 6 mile) collapsed summit caldera. Gaua is one of several volcanoes monitored by the Vanuatu Geohazards Observatory. The dark blue-green waters of Lake Letas, formed within the caldera, are visible at image center. The majority of Santa Maria Island is covered in green vegetation, with areas directly west and south of Mount Gharat covered with grey ash deposits. Patchy cloud cover is visible to the west and south, but is easily distinguished from the steam plume by its linear nature and brighter tone. Ambrym volcano has been emitting minor ash from its eruptive vents and has been degasing substantially in the last 7 days. The Volcanic Alert Level of this volcano is yet at Level 1 but could change in the coming days. The area of high risk is near the craters. With this situation, villages and communities of Ambrym island, especially those in the prevailing trade winds direction will expect ash falls and acid rain that may cause foliage fumigation hence damage garden crops. Satellite images of 02nd, 04th, 11th, 14th and 16th June showed important degasing from the volcano that could cause damage to the environment and contaminate water in the communities or villages. Thus approaching the volcano could be dangerous or not safe; it would be safer to view the volcano far from the craters to avoid any volcano related incidents. Therefore it is recommended that all communities, villages, visitors and travel agents seriously consider this information. The Department of Meteorology and Geohazards is monitoring closely the volcanic activity of this volcano. The next information on the status of the volcano’s activity will be issued when more information is available. "However, this report is actually quite alarming in the "standard" of Ambrym and Marum. Sur the Ambrym, weather of recent days conditions with a lot of rain, have confined the gas inside the crater, which did not prevent the experience "Ambrym in 2013" to reach the edge of the lava lake. During the last 24 hours, Popocateptl has registered 35 small explosions. Because of bad weather it could not be observed whether the steal contained a lot of ash and gas. During the early hours of the today, 2 weak volcano tectonic earthquakes were recorded. An average of about one earthquake a day has occurred at the volcano since 11 June. This is somewhat unusual for the volcano since it typically displays a relatively low rate of earthquake occurrence. I believe the recent uptick in seismicity at Mount Shasta, the Greenville earthquake sequence, several deep (30-40 km depth) events beneath the Klamath Mountains to the west, as well as recent small earthquakes at Lassen Peak can be related to a just ended Slow-Slip Event along the subducted slab beneath the region. The SSE nucleated southwest of Lassen Peak on May 11th and rapidly migrated east and then northwest (to immediately west of Shasta) through 13 June. Slow-slip occurs when the overlying crustal plate periodically (and only partially) detaches from the underlying (subducting) oceanic plate and slowly slips (millimeters/day) westward (contrary to its normal eastward movement) over a period of days to weeks. The events occur about every 14 months beneath Washington and British Columbia, about every two years beneath Oregon (one just occurred there earlier this year! ), and yearly beneath Northern California. While interesting, the earthquake activity at Mount Shasta does not portend anything exciting. It is likely the volcano is simply "re-adjusting" to relatively the rapid crustal movement which has occurred in the region this past month. I have observed this volcano-tectonic relationship before further to the north (at Mount Saint Helens and Mount Rainier) during the 2009 SSE there (it was the subject of my Master's thesis). During that time, sympathetic swarm activity occurred at both volcanoes! A rare view of Reventador volcano (Ecuador) in eruption today, along with the volcano's current seismogram. CVGHM reported that during May through 13 June white plumes rose 10 m above Sangeang Api's crater. Both the lava dome and surrounding areas showed no changes since November 2012. The Alert Level had been increased to 3 (on a scale of 1 to 4) on 19 May due to a trend of increasing seismicity. As many as 77 shallow earthquakes and 66 deep earthquakes had been detected daily. Residents and tourists were advised to at least stay away 5 km from the crater. Since then seismicity decreased; 15 shallow earthquakes and 3 deep earthquakes were recorded on 13 June. The Alert Level was lowered to 2 again on June 14. The public is advised not to approach the crater within a radius of 1.5 km. The eruption of Veniaminof volcano continues. Recent satellite images show very high elevated surface temperatures at the cinder cone inside the caldera consistent with continued effusion of lava. No plumes have been observed in satellite images however, small ash bursts rising to less than 15,000 ASL were seen in web camera images intermittently throughout yesterday. Volcanic tremor continues unchanged in the past 24 hours. Recent eruptions of Veniaminof volcano have all occurred from vents located on the cinder cone inside the caldera and were characterized by brief bursts of ash emission and small explosions with ash fall limited to areas on the flanks of the volcano. While a larger ash emission is not expected, it is possible and should be detected on the current seismic network. The current lava flow is expected to remain within the confines of the caldera. There is a possibility that activity at the volcano could increase with little to no warning. The eruption at Pavlov volcano is ongoing. Seismic tremor continues. Elevated surface temperatures consistent with lava effusion were detected in satellite images. A small ash plume from the summit vent is also seen in satellite data. Web camera images yesterday showed small, low level ash puffs emitting from the volcano. Current web camera images show mostly cloudy conditions. Previous eruptions of Pavlof Volcano have lasted for weeks, months or years and often exhibit fluctuating levels of activity and it is not uncommon for the volcano to enter short periods of repose followed by vigorous ash emissions, lava fountaining, and lahar generation. Occasionally past eruptions have generated vigorous ash emissions and clouds that reached 30,000-50,000 ft. above sea level. We expect this eruption to proceed in a manner similar to previous eruptions. Eruptive activity at Pavlof could increase with little to no warning. A little too busy with earthquakes today in Russia, Alaska and the Philippines. After Geohazard has raised the alert level to 2 on May 29, activity remained intense but relatively stable. From time to time, a few volcanic bombs get ejected on the outer slopes of the active cone. On June 17 the volcano began to show increased activity with a dense plume of ash, this during several hours. These webcam images below are showing the activity at different times. The earthquake swarm at Long Valley caldera (CA) appears to have ended, but included (felt) events to magnitude M3.0. Swarm events also shallowed slightly with time from around 8 km depth to about 6 km depth. The main residual magma chamber is located at 8 km depth although shallower magma apophyses are believed to occur beneath the "South Moat" where the swarm took place. This is one of the more vigorous earthquake sequences to occur within the caldera for some time. This is intriguing since inflation at the volcano ended last fall. A vigorous earthquake swarm is underway (beginning the past few hours) beneath the "South Moat" of Long Valley Caldera. Most of the earthquakes show focal depths of around 8 km which is the depth of the residual magma chamber within the caldera. Some of the events have been felt. A nice video from an explosion earlier today in the popocateptl volcano. We enjoyed looking some time at the minor intra-crater explosions of this dangerous volcano. Nothing unusual at the moment (see also update below), but great to follow at the every 8 second renewed image at clear weather like at the time of writing this update. AVO (Alaska Volcano Observatory) has released the first image showing evidence of the eruption of the Veniaminof volcano. The cloud contains clearly some ash. The image was taken from a distance of 75 km, which explains in part the quality of it. The last report from AVO (12:55 on June 13, local time) mentions that : An eruption at the intracaldera cone is likely underway today as determined from satellite observation of elevated surface temperatures this morning at 13:25 UTC (05:25 AKDT), prompting AVO to raise the Aviation Color Code and Volcano Alert Level to ORANGE/WATCH. Seismic tremor continues and is indicative of low-level effusive activity and small explosions. No ash plumes have been observed this morning although clouds have obscured web camera views of the summit. Any low-level plume produced would drift to the northwest based on predicted wind trajectories. AVO has been monitoring Veniaminof closely since elevated levels of seismicity became persistent on June 8. Steam plumes issuing from the intracaldera cone have been observed in web camera views since then, but so far no ash emissions have been confirmed. Recent eruptions of Veniaminof Volcano have all occurred from vents located on the intracaldera cone and were characterized by brief bursts of ash emission and small explosions. Ash plumes associated with this type of activity are typically diffuse and generally do not reach more than 20,000 feet above sea level. Ash fallout is typically limited to the flanks of the volcano. Minor emissions of steam and ash may persist for for weeks to months. The last episode of more energetic activity occurred in 1993-94 when an ash plume rose to about 18,000 feet above sea level and small lava flows poured onto glacier ice around the intracaldera cone. An eruption in 1983-84 produced an ash plume that reached about 25,000 feet above sea level. - N5607 W15932 - N5605 W16033 - N5647 W16030. W15911 - N5606 W15928 - N5603 W16030 - N5651 W16026. W15904 - N5611 W15934 - N5607 W16013 - N5704 W16024. RMK: SIESMIC ACTIVITY INDICATES CONTINUED LOW-LEVEL EMISSIONS. A small explosion occurred at 9:15 pm Thursday. Villagers were immediately alerted by the explosion and ash cloud. Despite this activity Merapi status is still called "normal" . The regional Disaster Emergency Management Agency (BPBD) said thar "Residents do not have to panic and worry. Small explosions and ash emissions are a normal pattern for Merapi volcano. The ash layer can also be seen on the plants who are growing on the western slopes of the volcano. All the parameters of the volcano are still being normal, so no change is being expected in the status of the volcano at this time. Compiled from various local sources. If you do not believe us, you can always look for yourself at the volcano webcam here 🙂 - You will have to check for yourself as our webcam image does not show the steam from he crater (which we saw earlier today). You maybe more lucky. AVO Alaska reported a little while ago : Elevated surface temperatures observed in satellite images of Veniaminof Volcano this morning at 13:25 UTC (05:25 AKDT) indicate an eruption at the intracaldera cone is likely underway. AVO is thus raising the Aviation Color Code and Volcano Alert Level to ORANGE/WATCH. Seismic tremor continues and is indicative of low-level effusive activity and small explosions. No ash plumes have been observed this morning although clouds have obscured web camera views of the summit. ER : cloudy skies are obscuring the (distant) view on the volcano. The volcano still shows some activity as it can be seen on the FAA webcam image below. A strong, what resembles a mainly steam plume can be seen at the right side of the mast. A long time lapse video of Sakura-jima explosion earlier today. Cenapred June 11, 1600 GMT : In the last 24 hours, the monitoring system of Popocatepetl recorded 38 low-intensity exhalations accompanied by emissions of steam, gas, and it is likely that some of them were also accompanied by small amounts of ash but this could not be confirmed, because of the presence of clouds in the area, which hampered visibility. Yesterday, the largest held at 13:02 and 3:10 p.m., 5:22 p.m., 6:43 p.m. ET 11:08 p.m. pm and this morning at 4:04 am. In addition, 7 volcano-tectonic earth tremors are detected at 17:06, 5:32 p.m., 5:42 p.m., 5:59 p.m., 6:05 p.m., 8:38 p.m. ET 20:54 h yesterday, all Mc <2.5. For most of the period covered by this report, the terms of clouds hampered visibility. However, this morning, it was observed a thick column of steam rising about 1 km above the crater before being diverted to the north by the prevailing winds. 1. Continue to monitor the safety radius of 12 km, presence in this area is not allowed. 2. Some traffic rerouting applies. 3. Popocatepetl volcano monitoring is performed continuously 24 hours/24. Any change in the activity will be reported in due course. Rest assured, Tungurahua has not regained activity. Seismic action is low. in June 2013, the observatory recorded 15 LP events and one volcano-tectonic (VT). No observations were made of the surface activity, due to the persistence of clouds in the crater area. The only risk at the moment are the risks of lahars in the event of heavy rains. But I merely come up with this report to catch your attention for an exposition of Children's paintings of Tungurahua. The children are all living in the direct vicinity of the volcano. "VOLCANO EL ES MI VECINO"
The exposition takes place in the Baños town hall. Taal Volcano in Batangas province showed heightened activity after at least nine volcanic quakes were recorded around it in the past 24 hours, according to the Philippine Institute of Volcanology and Seismology (Phivolcs). Paulo Reniva, science research assistant of the Phivolcs’ Volcano Monitoring Division, said these quakes were monitored from 7 a.m. Tuesday to 7 a.m. yesterday. Phivolcs recorded seven volcanic quakes in a previous 24-hour observation period. Despite the increased activity, Reniva said “there is nothing to worry about” since tremors below 10 are still within the “normal parameters” of a volcano under Alert Level 1. Alert Level 1, which means that hazardous eruption is not imminent, remains in effect over Taal. However, Reniva reminded the public to stay away from the main crater due to sudden occurrence of steam explosions and accumulation of toxic gases. Taal has about 40 craters, above water and under water, which have so far been discovered. in the afternoon of June 11 AVO reported : Ash emissions from Pavlof continue. Seismic tremor and explosion signals accompany the activity. Intermittent elevated surface temperatures consistent with lava effusion were observed over the past day in satellite images. Satellite images and pilot reports from the last 24 hours indicate minor ash plumes consistent with low-level (less than 20,000 ft asl) winds. Web camera images were cloudy. Some events were already treated on this page when they happened, but we give them as a reminder anyway. AVO Alaska reported on June 10 that : Ash emissions from Pavlof continue. Seismic tremor and explosion signals accompany the activity. Persistent elevated surface temperatures consistent with lava effusion were observed over the past day in satellite images. Satellite images from the last day show an ash plume extending 33 miles (53 km) southeast of the volcano. This direction is consistent with low-level (less than 20,000 ft asl) winds. Web camera images were cloudy. It looks like the volcano has stopped his activity at the moment. The webcam shows a clear sky and no longer a steam / ash cloud. The alert level is still the same and the seismogram does not show a lot of changes neither. We will follow up this activity on a regular basis. Small seismic crisis Paluweh on June 10, 2013, but not much other activity. Earthquakes going on for about 1-2 hours. Small rockfalls on the southern flank. The Paluweh, also known as the Rokatenda forms the island Paluweh (8 km wide) north of the volcanic arc that crosses the island of Flores. Although the volcano is about 3000 m above the seabed, its peak only 875 m. The vast area of ​​the irregular summit contains overlapping craters up to 900 m wide and several lava domes. Several flank vents are located along a NW crack. The largest historical eruption of Paluweh occurred in 1928, when a strong explosive eruption was accompanied by landslide-induced tsunamis and the forming of a lava dome. The news of this activity has been confirmed by the hotspot as detected by the satellite yesterday. below a nice clear image of the FAA Perryville webcam showing a quite big plume considering the distance from the webcam to the volcano. An impressive SO2 plume from Nyiragongo volcano (DRC) today. While these plumes do not always occur in-conjunction with actual eruptions, they do indicate a large input of fluids (including magma) into the volcano's shallow magmatic system. VT earthquakes have recently increased at Sabancaya volcano (Peru), also indicating renewed magmatic intrusion at that volcano. The SEISMICITY continues to occur outside the volcanic edifice within 15 km of the crater. It is a fairly common tectonic behavior observed in numerous volcanoes at the beginning of reactivation phase. Russia's northernmost active volcano is churning out ash to a height of up to 9,000 meters (29,500 feet) in the country's Far East, local scientists reported on Monday. The 3,283-meter (10,771-foot) Shiveluch volcano increased activity in May 2009 and has been periodically spewing ash from three to ten kilometers. “Video monitoring of the volcano was complicated due to poor weather conditions, but seismological stations registered over the past 24 hours almost 150 local seismic activities with the most continued one accompanied by a spew of ash up to a height of 6.9 kilometers, give or take 2.2 kilometers,” a local department of the Geophysical Service with the Russian Academy of Sciences said in a statement. Although the current eruption poses no immediate threat to nearby settlements, the ensuing ash fallouts could be hazardous to health and the environment. Update June 9 : According to seismic data by KBGS RAS, at 21:02 UTC on June 09, possible ash plume rose up to 7-8 km a.s.l. There is not visual data because the volcano obscured by density clouds. At daylight the activity cloud can well be seen on the FAA webcam at Perryville. The image below dates from 05:22 Local time (=13:22 UTC). Over the past two days, AVO has detected gradually increasing seismic tremor beneath Veniaminof. They therefore raised the Aviation Color Code to Yellow and the Volcano Alert Level to Advisory. Clear web-camera and satellite views currently show nothing unusual at the volcano. Similar seismic activity has been associated with ash emissions at Veniaminof in the past, most recently in 2005. Yesterday seismic tremor continues at Veniaminof. Clear web camera views showed a steam plume over the past 24 hours, though it is difficult to see in daytime views. AVO has received no other reports of activity. Update at the time of writing : Activity continues like we can see on the webcam images below. A smoke plume (steam and/or ash is difficult to see) is visible on these webcam picture (Perryville NW). The seismogram shows a serious earthquake a little after 8 UTC. This is a far out in the sea earthquake which has nothing to do with the volcano. This was the earthquake which is viewable on the seismogram. Some history : The volcano was the site of a colossal (VEI 6) eruption around 1750 BC. This eruption left a large caldera. In modern times the volcano has had numerous small eruptions (over ten of them since 1930); these are located at a cinder cone in the middle of the caldera. Veniaminof has one of the highest elevations of Alaskan volcanoes. Partly for this reason, it is covered by a glacier that fills most of the caldera. Because of the glacier and the caldera walls, there is the possibility of a major flood from a future glacier run. No action here, it is only a dormant volcano, but a very big one. Photographer Dan Douglas has TimeLapsed the clouds whirling around the volcano and has compiled it with some great music. He called the video "The House of the Sun". Enjoy this outstanding TimeLapse video in high quality. Eruptive style (historical): Strombolian eruptions of ash. Lava flows mostly limited to the inner crater. Notable features: Persistence convection a phonolite lava lake. Erebus has a lava lake and is definitely the most active volcano in Antarctica. However, some dating age existed for the lavas of the entire Mt. Erebus and that it had been limited to imprecise conventional dating. From 1993, Dr. Philip Kyle and two of his students (Chris Harpel and Richard Esser) began to use a more advanced dating techniques dating to high precision to determine the age of the majority of lava flows exposed on the Mt. Erebus. Before using the 40Ar/39Ar geochronology on Mt. Erebus, little data exist, and age suggested that the volcano was aged millions of years. We now know that the entire volcano is just a little older than 1 million years and that the peak is significantly younger than 100,000 years. JMA reported that during the period May 27-31, Sakura-jima had four explosions with ejected tephra that fell more than 1.3 km from the crater. Incandescence from the crater is almost all times detected during the night. A small pyroclastic flow traveled 700 m down the eastern flank. A pyroclastic flow also occurred in the crater. Based on information from JMA, the Tokyo VAAC reported that on May 30 the explosions produced "feathers" that rose to altitudes of 2.1-2.4 km (7,000-8,000 ft) and drifted E. An explosion was detected on June 1 and June 2, which produced an ash plume that rose 1.5 km (5,000 ft). On Friday, the monitoring system of Popocatepetl recorded 62 exhalations of low to moderate intensity, accompanied by emission of steam, gas, and sometimes small amounts of ash. Yesterday, there were four events volcanotectóniques 10:15 24:51 M 2.5 M 2.7 h to 1:03 p.m. and 9:15 p.m. M 2.4, M 2.1. During the day yesterday, the skies were not allowed to continuously observe the volcano, however, for short periods of time, it has been observed emission minor steam, gas and low ash. When this day has remained visible and clear, a plume of steam and gas southwest stood at a height of about 400 m above the crater. Ash emissions of Pavlof resumed Tuesday, June 4 and continuent.Des earth tremors and explosion signals accompany the renewed eruptive activity. Image taken at 4:58 (Alaska time), and an analysis of the plume (assuming he remained in the field of the camera), totaled around 15,000 ft or 4.5 km. Satellite images, pilot reports, and recent views cams showed ash clouds amount to 18,000 meters and extending up to 25 miles (40 km) downwind of the volcano. The eruptive episode began on May 13 with continuous ash emissions until May 28, when the volcano calmed down until the upturn June 4 Such breaks are common during eruptive episodes Pavlof, which often last for weeks to months. The current activity could become stronger without warning, and the AVO continues to monitor the volcano. Change alert IBU level, volcanologists are passed to the VSI "SIAGA" level (alert 3 on 4). Like many volcanoes in Indonesia, Ibu is a little visited its summit. His ascension requires between 6 and 7 hours of walking on some steep slopes. Given this lack of access few inhabitants or tourists actually reached its peak. But no one needs to climb to the top that the 1325 m high building is very active. Seismic data collected by a station on the side, mid-way between the top and the first houses, and relayed in real time to the observatory located about 20 km, show that Ibu volcano is constantly erupting.